Blogging Habits to Grow your Blog! Let’s face it: blogging can be very confusing at times. There is just so much to do: Social media, blog commenting, writing blog posts, generating traffic to your site, building your e-mail list, keeping your WordPress plugins up-to-date or recording YouTube videos. Yet, this list is just the tip of the iceberg and your potential task list could be much bigger. You are facing a dilemma since you don’t know which parts of blogging to focus on and this causes you to be ineffective: you don’t get enough of your important blogging tasks done, thus the growth of your blog is slowing down. If you become confused and distracted, I don’t blame you: I have experienced those feelings too. That’s why it’s time to define a better course for your daily blogging. When you are trying to do too much and you don’t focus on one aspect at a time, you are going to feel overwhelmed for sure. For instance, when we talk about social media alone, there are a lot of platforms out there that seem very compelling to be part of: Twitter, Facebook, LinkedIn, YouTube, Pinterest or StumbleUpon. Trying to dominate even one of these platforms requires lot of work and I don’t know about you, but my time is actually very limited. Yes, on top of blogging, you might have a day job and a family too. Then there is the “but this expert is telling me to do this” story. Too many experts and gurus are telling us what to do and what not – and everyone has their own opinion. Naturally, you like to follow the big names and actually follow their recommendations. Unfortunately, what tends happening is that you have yet another piece of advice (for example a new traffic technique) and you feel obligated to focus on and this is adding yet another row to your already long daily task list. When digging this issue of lack of focus a bit deeper, there is one common denominator on the background: fear. It’s fear that is keeping you in its hold: you want to be everywhere and try everything, because you really don’t know what works and what not. So, it’s better to do everything, because that way you are going to find your blog’s success at last, right? Being overwhelmed is something you should absolutely avoid and with the current strategy, it’s not possible. That’s why you need to implement one keystone habit in your blogging and it has the potential of changing the course of your blogging career to upside direction. Let me introduce keystone habits and what they are. 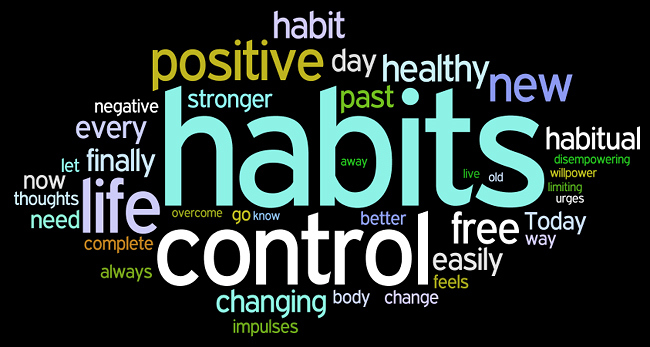 This is a term I learned after reading a great book by Charles Duhigg: The Power of Habit. The keystone habit is described as one single good habit, that when implemented, can reflect to other parts of your life and therefore help you in making profound changes to your life. For instance, when I started exercising (keystone habit) years ago, I also wanted to put my diet in order. I did that and I lost weight. Even if that wasn’t enough, I became more organized and productive and started improving myself by reading personal development books. Well, it’s implementing one keystone habit in your blogging, which would potentially improve the other parts of your blogging too. The question is: what is this habit? Based on my experience, it’s writing guest posts. Just think of it: guest posting can bring great rewards to you as a blogger when done consistently. As you can clearly see, implementing this guest posting habit can bring many great benefits to your blog and to your skillset. 1. Have a growing list of ideas. This should go without saying, but whenever a new post idea strikes you, write it down. Better yet, have an idea list on Google Docs (or any other place in the cloud), so it’s easily accessible and manageable. 2. Plan your blogging week. Every Sunday, sit down for a moment and plan your coming blogging week. In particular, plan your coming guest posts (on which day you are going to write what post) and stick to the plan. For instance, my typical routine is write 3 posts per week, +-1 post, depending of the week. 3. Outline the posts in advance. Every Sunday, I outline the posts I’m writing in the following week. This helps me jump into the writing mode – as soon as I start my computer in the morning. Also, after outlining the posts, my brain keeps working on them in the background. I might get some new ideas to implement when I finally start writing the posts. When it comes to outlining and planning my posts, I’m following a certain system that has proved to be effective. 4. Have a solid system to follow. The system … Yes, it’s the one that Danny Iny teaches. In fact, this guest post is following the very same system. Naturally, your system could be different and that’s fine. But the most important thing is to have at least some kind of system in place. This helps you become more effective when writing your guest posts. 5. Write them first thing in the morning. If you have a limited amount of time at your disposal and you have other important things in your life – like a day job or a family, then I suggest finding the quietest time of the day for your writing. For me, this is in the morning, before going to work and before my family wakes up. Even if this means that I have to wake up early (05.00 AM every day), I know that by the time I have to go work or my family wakes up, I have done the most important task of the day. 6. Be consistent. Remember the step #2 on this list? Its purpose is to help you with consistency. Also, it’s the consistent action that brings you the reward – not the random one! Try to output at least two guest posts per week and submit your posts to various blogs out there. This way you are “everywhere” and you understand which blogs bring you the biggest results (in terms of traffic and subscribers) and which blogs to focus on in the future. 7. Do the proofreading and batch-process the delivery. My posts are proofread twice: once by me and once by an external proofreader. I do the first round of proofreading myself and after that I try to submit them in one “package” to Fiverr for additional proofreading. Once I get the posts back from Fiverr, I submit the posts to various blogs at once. As you can now understand, implementing one keystone habit – writing guest posts – is very important to your blogging success. Once you do it consistently, it’ll bring you results and other parts of your blogging are going to improve as well. Over to you: Are you guest posting? What benefits have you achieved with it? Timo Kiander, a.k.a. Productive Superdad, teaches WAHD superdad productivity for work at home dads. If you want to improve your blogging productivity, grab his free e-book, 61 Ways for Supercharging Blogging Productivity. I love this post. It is so easy to get distracted. I did my monthly post for a publication at 3 am and stayed off email and social til it was completed. I think focus is key to achieving some of our tasks as bloggers. I’m at lunch now on Google+ where I found your inspiring post. I try to comment on a few blogs on my lunchtime. Thanks for sharing your advice on this one, makes it sound possible. Yes, focus is very important – especially when it comes to writing. I just couldn’t produce anything meaningful, if I was distracted when I write. Love the idea of keystone habits. I find that I spend all day dealing with little tasks that seem very important. Then I don’t have time for the big important tasks, like actually writing a blog post. You’ve inspired me to start writing first thing in the morning before I check my Inbox. Writing outlines on Sunday is another habit I want to start. Thanks for this post! Give this system a test drive and see if it helps you to become more productive. I like the ideas you have in this article. Unfortunately for me I blog when I can where I can. I don’t get the luxury of actually sitting down and write uninterrupted. Hopefully I will be able to do this full-time. Then I know I could write so much more! I try to write before my family wakes up. That’s the only time I can write uninterrupted. I’m glad to read your guest post here and will be happy to read more of your articles. This article is full of ‘meat’. I definitely approve the 7 steps to implement the keystone blogging habit. I’m trying to keep to a strict plan. Though my blog is still new, being consistent will surely be very productive. Glad to hear this post was valuable to you! Also, thank you for pointing out the faulty link. It’s working now! These distracting factors are very common in blog. I like the idea of keystone habits. These are actually better idea. Thanks for the share!! If you’d like to learn more about the habits (like keystone habits), then I encourage you to buy the book, “The Power of Habit”. It’s definitely a book worth getting. You know there’s only one thing I need to work on, that’s planning week (my blogging week). Maybe, because I am not a full time blogger. I also have to manage my college studies and other stuff. I am having some extra work these days. That’s why I am unable to give time to my blog, I am getting late in replying to emails, being inactive in my contest and so. No more excuses. I am gonna fix things up real soon. And thanks for the awesome post, BTW. I really loved the article. I hope to have you again for guest post here. Sure, I’ll write another guest post in the near future. Anyway, what you said about planning … it’s very important. At least, I realize that I need to have this kind of structure in my life and it makes it easier. Having the key tasks laid out on a document will help you to focus on those things and get them done by the end of the week. Yes, consistency is important part of any successful blogger – I agree!